Ah, The age old questions..."Do tattoos hurt? ", " How much does it getting a tattoo hurt? 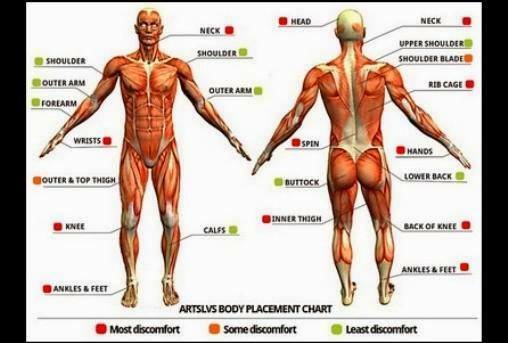 ", "Which part of the body hurts most?" and of course, "What does getting tattooed feel like?" Ten minutes on Google will be enough to provide you with a variety of opinions and comparisons and you will be, more than likely, no further forward. In this section, I give you my take on things and in all honesty, the fact is the answers to these questions are in reality rather vague, but that is the nature of the beast. The internet is full of words of advice to people thinking about getting tattooed. Some of it’s good, some of it’s bad and some of it is just plain ridiculous. I’m not here to preach or give you absolutes, I can only point you in what I believe is the right direction, a direction that works for me and has worked for me for the last 15 years. 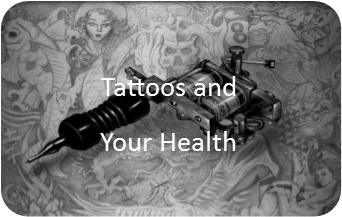 I’m by no means what I’d call “heavily tattooed”, next to some people I am, next to others, I’m absolutely not, but as a veteran of over 50 hours (so far) sat in a tattooists chair, I know enough to point those of virgin flesh in the right direction. I want a tattoo but I’m scared of the pain! I’ve found a lot of advice about the pain of getting tattooed on the internet and most of it, I don’t feel is particularly helpful. We naturally fear pain and getting tattooed involves pain. The pain it involves is indescribable, literally indescribable but not because it’s horrific. You literally can’t describe the sensation, it’s like nothing else, yet so many people try. I’ve recently read that it’s like being carved with hot knives…really? When was the last time you met somebody who had been carved with a hot knife? I’ve heard tell it’s like being slowly scratched by a cat…erm, nope. Then there’s the comparison to having hundreds of injections all at once…wrong, wrong and wrong again. I’m not going to tell you what it’s like, because I can’t. I can’t tell you any more than a woman can tell me exactly what child birth is like or than a man can describe THAT moment in “There’s Something About Mary” (that scene that makes every man in the world wince) to a woman. Let me tell you, I know for a fact getting tattooed doesn’t hurt as much as one and I’m pretty sure it’s nothing like the other. ​One hour of toothache vs one hour of tattooing…I’ll take the tattoo. One hour of earache vs one hour of tattooing…it’s the tattoo again. One hour of the feeling you get when you stub your toe or an hour in the chair…tattoo me some more. Five seconds of my girlfriend's cat sharpening its claws on my leg or an hour having thousands of pin pricks in my body....guess what, it's the pin pricks. One hour of being gently massaged by beautiful Swedish girl or one hour in the tattoo hot seat…are you kidding? Oil me up, Helga!! Getting a tattoo is not like any of these things but, with the exception of Helga, it’s preferable to all of them in terms of how much it hurts. Yes, some people have a lower pain threshold than others. Yes, some parts of the body hurt more than others Yes, some tattooists are heavier handed than others and yes, on the day I went for my first ever tattoo session I was terrified of how much it was going to hurt. The truth is, it’s no where near as bad as you may have been lead to believe by people who try woefully to describe that which can’t be described, it just isn’t going to tickle either. The simple fact is getting a tattoo is literally, no pain no gain. If we let the fear of pain prevent us from doing things the human race would have petered out long before now, due to the fear of child birth related pain. ...or maybe not so bad afterall. But I’ve heard some people pass out! I can’t lie and say it doesn’t happen, because it does and from what I’m told by tattooists it happens a little more than I imagined. One of my best friends almost went lights out recently (he is now found under “Jelly Legs” in my phone), he’s been back for two more sessions since. Take a break if you feel a little woozy, your tattooist will understand, most will periodically ask if you’re OK or if you need a break. So, if you need one, say so. As I said earlier, it effects people in different ways but don’t take it that because somebody you know passed out, you’ll pass out. Don’t let the fear of what might happen govern whether you get what you want or not. I’d apply that to everything in life, not just getting tattoos. Don’t forget, your tattooist is a human being too, they aren’t some ink dispensing Terminator, they have seen it all and they’ve seen it more than once. They understand what you’re going through because once upon a time, they were sitting where you are. Nervous, a little scared and about to take their first step in to the wonderful world of tattoos. They would also much rather sit back and let you have a drink and a break for five minutes than have to pick you up off the floor and get the smelling salts out. Just consider this, if passing out was so common…wouldn’t tattooists have a recovery room to handle all their unconscious customers? I've been reluctant to add a tattoo "pain map" for the simple reason...they're all different, so how exactly are you supposed to get an idea of where hurts most? The image I've added below is the closest to my own personal experience, though even this isn't definitive, in my view. Everyone has a different capacity to handle pain and everyone will have a parts of their body that hurt them more or less than when an entirely different person has those same areas tattooed. As an example, I was reliably informed that having my spine tattooed would really hurt. In reality my shoulder blades hurt more (and even that wasn't unbearable) yet, according to the diagram, it shouldn't have. What this illustration does is give you a very rough idea of what is going to be more or less comfortable, but until you have it done...and I know this isn't what you want to hear....you just won't know. Well, we know it’s going to hurt. Maybe it will hurt a little, maybe it will hurt a lot but more than likely it won’t hurt nearly as much as you think. There are sprays and and creams that you can buy to numb the area, some tattooists use them, some don’t. Personally, I’ve never used them and they are something I’ll be investigating during the construction of this website to give you more information. From what I understand, they take the edge off the pain but don’t completely remove it. We also know to ignore people who say, “getting tattooed feels like…”. It doesn't matter what they say next, it won’t be a comparable sensation. You’ll know what it feels like when you get it done and when you get it done, you’ll understand why I refuse to liken it to anything else. You might pass out. However, you probably won’t. Taking a break is OK and in some cases encouraged. Nobody will think any less of you. Tattoo artists are people, too. They spend their working day in physical contact with their customers, they are “people people”. However, they aren’t, generally speaking, mind readers (mine appears to read mine but it’s not the norm) if you have questions, ask them. If you have concerns, air them. If you need a break say so. 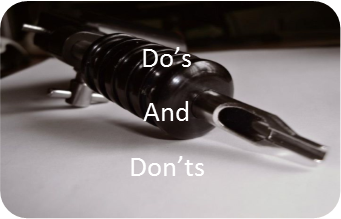 On the other hand if you have any technical or artistic advice for them…I suggest you give that to the dog when you get home, because if you’ve picked your artist in the right way, your tattooist won’t need it and they certainly won’t thank you for it. If you have any questions or feed back, please don't hesitate to get in touch.